With many different coffee machines, portable coffee options including some great pull-apart percolators, and other hand operated machines for ground coffee the one thing that set the Handpresso apart was its ability to handle E.S.E Pods (cialde). We might be a little biased in that but there are plenty of reasons it works well for us, and many of our customers, especially because when using Lucaffe Coffee with a Handpresso you get beautiful italian coffee every time. The machine packs away and is lightweight to suit backpacks, camper trailers, campervans and caravans or even a suitcase. So you too can have great Italian Coffee whenever you go camping! We wanted to make it easy for our customers to enjoy our coffee wherever they go. Lucaffe customers cover a wide range of people and travelling types so by recommending the Handpresso as your Portable Coffee Machine it will work whether you are glamping, hiking with just a bedroll, family camping beside the beach in pop up tents, caravans, camper trailers, campervans, backpacking, even when travelling for work so you can have fantastic coffee in your room. We take our Handpresso when we go camping at Stradbroke Island in Queensland where we have no power and it works perfectly. Even better you don't have to just have one coffee flavour so you can take a bunch of different coffee types to suit you, your partner and friends. No need to worry about packing down the percolator, or breaking the French Press. You won't need to drink instant coffee while camping ever again. 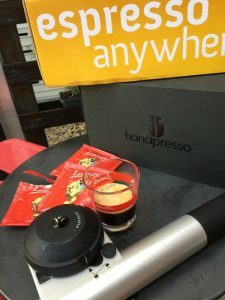 If you can't find a Handpresso near you, we can source them for you and send it to you with your coffee order, check out our Shop and we have one listed there. We only keep 1 or 2 in stock but can get them quickly, so it won't delay your order. 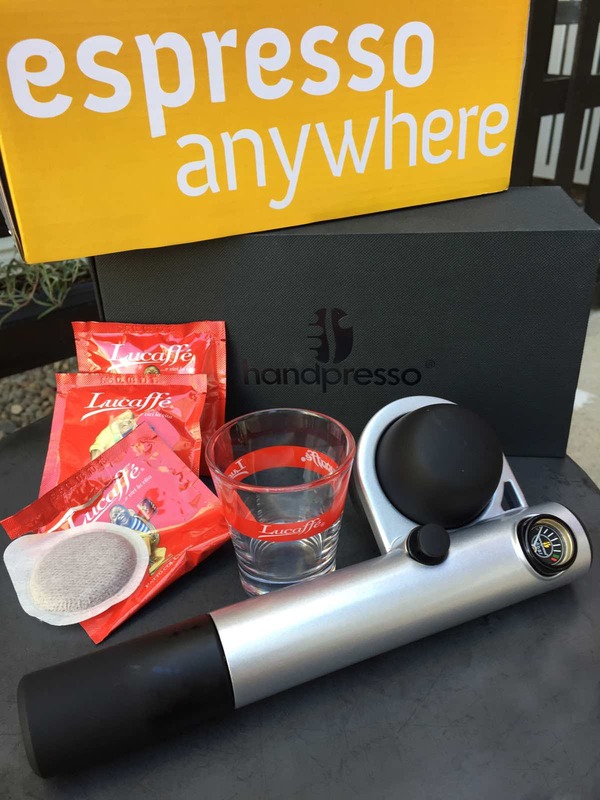 Do you already own a Handpresso? Buying great coffee for your Handpresso is easy. We ship every day Monday - Friday and can ship to anywhere in Australia. 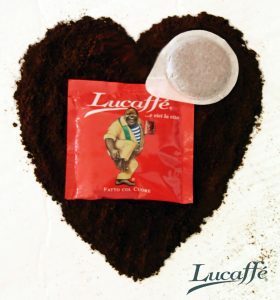 Simply choose which type or types of Lucaffe Coffee would best suit you (or choose a tasting pack if you aren't sure) and we will ship it to you. Run out of coffee while on the road? Simply order some more and put in the nearest post office or caravan park you will stopping at and we will ship it to you.